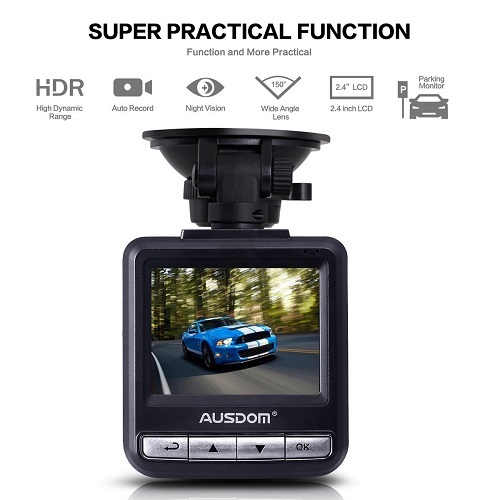 The Ausdom AD282 dash cam offers Full HD (1080P) and 2K. The video quality is excellent. The camera uses the Ambarella A7 chip which is very good (many other dashcams use generic and much weaker chips, which is noticeable). Of course there are other dash cams that even record at 4K, but in my opinion – 1090P (Full HD) is more than enough. Remember that any resolution higher than that would take much more storage space. The wide angle lens are very effective. 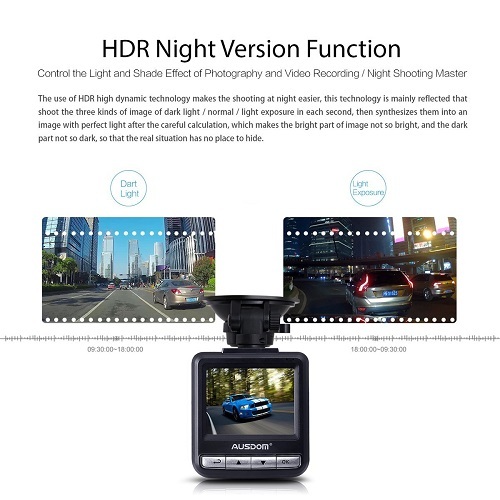 I do want to mention that there are other dash cams in this price category that in my opinion, offer a little bit better video quality. One of them is YI 2.7(Amazon link). This dashboard camera is very popular as well. Another great dashboard camera you may want to check out is Z-Edge Z3 (Amazon link). It has a big screen and offers excellent video quality (records 2K as well). I persoanlly really like Z-edge’s dash cams. I think they provide great value for your money, and the price always reasonable. The Ausdom AD282 dash cam, like almost all other devices, records in loops. That means that it saves small chunks of videos, and if nothing happens, and when no more storage space is left – it deletes the old files. In case of an accident, you want to prevent that – so your video won’t be deleted later on by the loop recording option. That’s excatly what the built-in G sensor is used for. The Ausdom AD282 dashboard camera is easy to setup. On YouTube for example , you can find many tutorial videos that show how to install dashboard cameras. While it is very easy, if you are not sure – ask a professional to do it for you. The camera itself starts working when you ignite the engine, and turns off when you turn off your car. The camera works by itself so you won’t have to mess with it and waste time. If you are looking for a reasonably priced dash cam with great video quality – defiantly buy Ausdom AD282. It works really well and provides good value for your money. Sure there are better dash cams online that even record at 4K – but not all people really need that extra quality. I hope you found this Ausdom AD282 review helpful. If you have any questions about this dashboard camera or any other device – feel free to comment below. On our website you can also find many other interesting and useful dash cam reviews – check them out !